Have you tried chia seeds? Chia pudding is one of my favorite ways to eat them. Chia seeds are so good for you. Chia seeds are a great source of fiber and will keep you full for a long time. 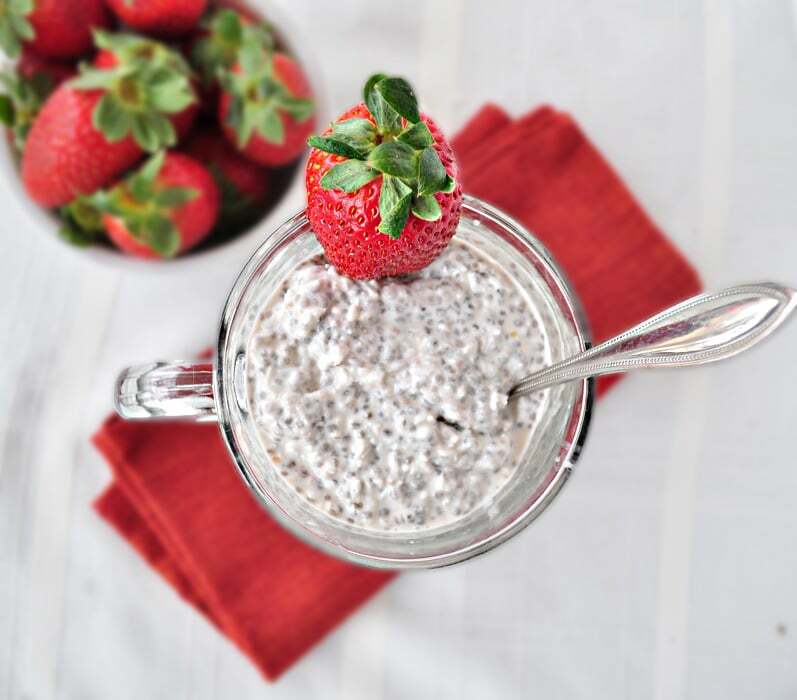 This Coconut Vanilla Chia Seed Pudding is healthy enough for breakfast. 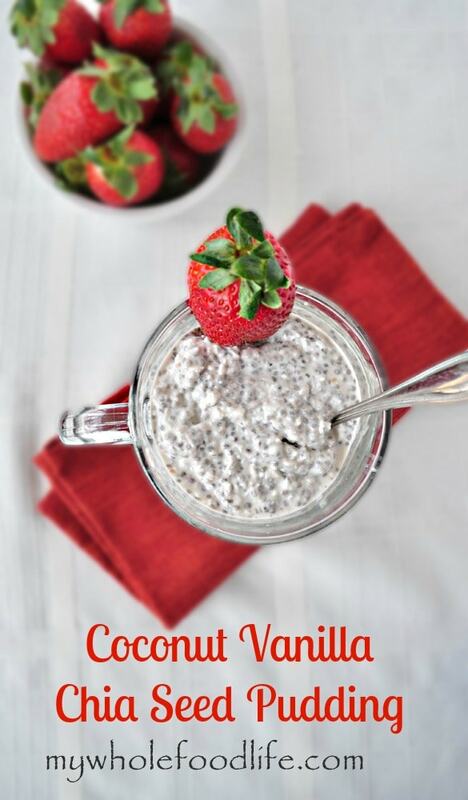 I modeled this coconut vanilla chia seed pudding after my coconut vanilla overnight oats. They are so yummy and I knew the flavors would be great in this coconut vanilla chia seed pudding. You can make this coconut vanilla chia pudding up the night before and have a healthy breakfast ready in the morning. Super easy! I even filmed a video of my daughters and I making this. It’s pretty funny actually. If you cook with kids, then you will understand! For more videos, you can subscribe to my You Tube Channel. An easy and healthy breakfast you can prepare the night before! Mix all the ingredients in a bowl and stir well. You can prepare this the night before to be ready in the morning. It should last a week or more in the fridge. If you plan on adding fresh fruit to this, do so right before eating. The mixture may seem watery when you make it, but it will thicken up in the fridge overnight. If the mixture is too thick in the morning, you can always add some extra milk. Such a cute video! I kept laughing because my daughter does the SAME thing! Always wanting to stir and stick her fingers in everything! I made this tonight and I can't wait for the kiddos and I to try it in the morning. Unfortunately I burnt out my food processor trying to make the coconut butter:(.So I just added extra coconut and I also used coconut milk. Oh no! I hope your food processor is okay. :( I hope you enjoy the recipe. I made this with substitutions, Cacoa butter instead of the coconut, coconut milk instead of the almond and honey instead of the maple syrup. It was delicious! The video cracked me up! Chia seed pudding....better than a sandbox! Lol! They do that with any recipe I make! Funny kids! Made this last night and had it for breakfast and dessert tonight. It was delish! Love the simple healthy recipes. Thanks for sharing! You're welcome Karen! This is one of my favorites! You're welcome! Good to know almond butter works too! Melissa, I'd love to try this, but I don't want to make a separate batch of almond milk. Do you think I could put 2.5 cups of water, a handful of almonds, and a date (instead of maple syrup) in my Vitamix and blend, then use that as the liquid base? Thanks! You probably could. Let me know the results! I don't have coconut butter. Can it be left out? Or what could be used in place of coconut butter? So excited to try these! You can omit it and add a little more shredded coconut. I have organic cold-pressed coconut oil - could that be used in place of the coconut butter? This stuff is really deliciousI I have made it twice & followed the recipe exactly both times. It turns out great! My 8-year-old & my husband love it, too. YUM. Thank you!